Evolution Gaming has finally gone live with Dreamcatcher, their new Wheel of Fortune game that they previewed at the International Casino Exhibition in February 2017. 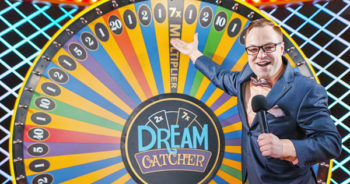 Evolutions Dreamcatcher is based on the Big 6 Wheel of Fortune, where there are 6 numbers that you can bet on that appear on 52 segments of the wheel. But there’s an added twist, with the Multipliers. An additional 2 segments have multiplier values of 2 times and 7 times. When these are hit, the subsequent win on the wheel is multiplied by one of those numbers. This can increase the top win from 40 to 1 to a massive 280 to 1. Evolutions Dreamcatcher is aimed squarely at new players to live casino and players that are more used to playing slots that like the thrill of hitting a big win. How many numbers can you Bet on? You can bet on them all! There’s even a “bet all” button to make it easier to do so. You can bet from as little as 0.10 a spin up to 10,000 at some casinos. There is a default maximum win possible of 500,000, although some casinos may have a higher or lower limit. Make sure you check out the paytable before playing. The game is available on a 24 x 7 basis with a new spin happening about every minute. Since it’s launch, not all Evolution Live casinos have taken the game. The ones that have are listed here. Otherwise, I’d recommend that you play at either Leo Vegas or Royal Panda.